Goshen College will be hosting the trio I’m With Her on Saturday, Nov. 3 at 7:30 p.m. in Sauder Concert Hall. The performance is part of the 2018 Performing Arts Concert Series. The trio, which PopMatters described as “a beautiful cohesion of tight harmonies, acoustic brilliance, and fresh songwriting,” sings folk and bluegrass, mostly of their own composition. 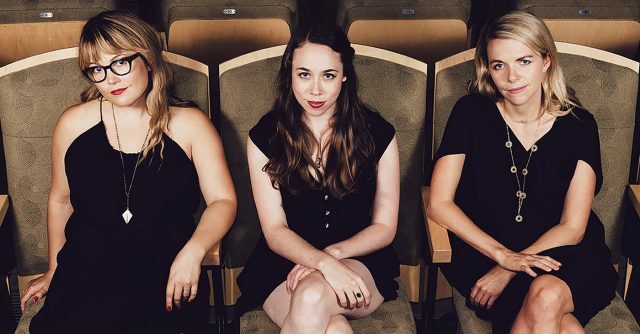 Sara Watkins, Sarah Jarosz and Aoife O’Donovan form the group, which released its debut album “See You Around” in February of this year. They are finishing up their 2018 “Overland Tour” across the US. In 2019 they will be touring globally. All three members of the group have an extensive musical background. Sara Watkins debuted as a fiddler and founding member of the band Nickel Creek with Chris Thile and her brother, Sean Watkins. She is a songwriter and plays the guitar and ukulele. While touring with the band The Decemberists, she played percussion. Watkins has several solo albums. Her first, a self-titled album, was produced by Led Zeppelin’s John Paul Jones. She won “Instrumentalist of the Year” in 2016 at the American Music and Honor Awards. Aoife O’Donovan, an Irish-American singer/songwriter, is a founding member of the bluegrass band Crooked Still. She has been a member of several other bands, such as Sometymes Why. O’Donovan studied contemporary improvisation at the New England Conservatory of Music. Some of her work can be found in television shows such as “True Blood.” She has performed beside many artists, including Yo-Yo Ma. The women discovered each other while performing at the Telluride Bluegrass Festival in 2014. This festival began in 1973 and takes place in Colorado each year. While harmonizing their voices over a single microphone, I’m With Her utilizes a collection of string instruments such as the guitar, mandolin and fiddle. Along with singing and playing a variety of instruments, each of the members take part in co-writing their songs. The trio stands out in a genre which is largely male-dominated. Traditionally, men like Ricky Skaggs and Mac Wiseman have stood out as star performers in folk and bluegrass. Today, Watkins, Jarosz, and O’Donovan are helping to redefine what it means to be an Americana singer in 2018. Tickets for the I’m With Her show are available for $45, $40, $30. They can be purchased through the Goshen College Box Office (574-535-7566, boxoffice@goshen.edu) or online at www.goshen.edu/tickets.